When faced with a sudden change in employment last November, Steve and I chose to take a courageous step. With our kids, pets, and savings, we left our home of 7 years in Denver, and headed back to Branson, where we'd lived for 5 years previously. Our plan wasn't as haphazard as it sounds. We'd been operating our part-time home bakery for 2 years under Colorado's Cottage Act program. We'd outgrown our kitchen, but were unable to find an allergy and Celiac safe commissary, and Denver real estate is expensive. Since we felt unable to mold our bakery into our full vision in Colorado, we'd begun pondering other locations. Branson holds familiarity, and family for us. But with a few years left until our kids were grown, a personal and business move was not in our immediate plans. Steve and I had made our share of "3 year plans" before, and seen them dashed by circumstance. We've always done our best to regroup and move on, but last November knocked us off kilter. In one fell swoop we lost our main source of income and feeling of stability. Our health insurance was retroactively canceled, leaving us with a stack of medical bills just as I received my Lyme Disease diagnosis. Remember that show Supermarket Sweep? That's the best way I can think to describe the manic action that ensued. We quickly wrapped up our bakery orders, said sad goodbyes to our customers, then dove into Denver's high-stakes, fast-paced home selling process. We sold our house in about a month, and struck out for Branson with enough cash to split between a condo and a bakery! It didn't take long to find our little piece of commercial real estate- an affordable small space in downtown Branson with a great layout! After negotiating terms, we met with contractors and city officials, had plans drawn up, waited for permits, and weathered the frustration of not being able to control the timeline! The first demolition blows felt delicious after months of fretting and waiting! No loans. No investors. We hired professionals for everything we couldn't safely, lawfully, or physically do, then rolled up our sleeves and tackled the rest. 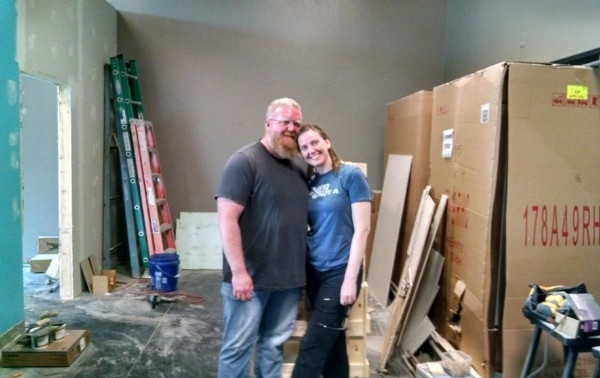 Steve and I have been through major home repairs and renovations before, but building a bakery was altogether different! We hit bump after bump, and felt disheartened through most of construction. It would have been easy to back out, and we considered it many times. Instead we leaned on each other and remembered why we started- we felt passionate about baking for a vulnerable population, and we needed a safe space in which to do so. That safe space didn't exist, so we had to build it. That's why we just kept going. We never really turned a corner. It never got easier. It never began to flow. Each day brought a Sisyphus stone. We cried a lot, cussed loudly, and apologized consistently. Laughter, often at the sheer absurdity of our circumstances, held our family together. Life is hard. Humor helps. As we limped into the finishing touches stage, it dawned on us that we'd need to open as soon as possible if we had any hope of paying our first month's rent! That meant there would be no recovery time, no lull before the storm. Looking back now, just over 3 months after opening, it's obvious we were dropped in a turbulent sea way back in November. Well no wonder we were sputtering by May! We've heard how risky our "mid-life crisis" is, and how likely we are to fail. We've been met with horrified eyes, dubious brows, and shaming head shakes. We've also heard how brave and resourceful we are. The truth is we've allowed ourselves to be driven by our values. We believe in inclusion and connection, and we know we can help provide these things with our gluten-free, allergy-friendly baking. We take risks and we own them. We're scared, of course, but we know our work is needed. Life calls us to make plans, and reserves the right to squash them, but when opportunities arise that match our passions, we build. Our dreams may fall down around us, and cost us everything, but by all means, we build. 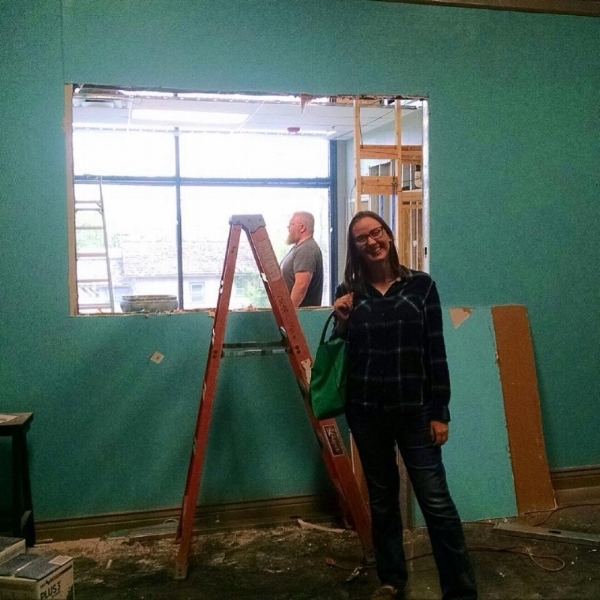 Thank you for reading this post about our bakery building! Did you know we recorded awkward videos during construction?! Tour #4 - Appliances and paint! Tour #5- A full walk-through! We'll share photos of our finished bakery, and speak out about first four months in our Branson location in our next post! Wishes for a little dream building of your own!